A floating fireball. Explodes when its HP falls below a certain point dealing damage to all players nearby, however deplete all of its HP and it will not explode. It is weak to ice. Found in a hidden map accessed by falling in the lava of El Nath's Cave of Trial 2, on the way to Zakum. Oddly, it is much weaker than the other monsters in the area, which range from 132 to 136. Found at Fossil Foundry 1 and 2 near Riena Strait. Found at the Polluted Glacier near Riena Strait. Attacks by blowing gas at you. Found in the Underwater Ice Caves of Riena Strait. The Black Wings bunny under it spits a dart at you. Involved in Mercedes quests. Note: His name is a mis-translation in GMS; Mu Young is a different person. Found at the Glacier Melting Camp near Riena Strait. Attacks by launching hot coal out of itself. Found at the Glacial Debris near Riena Strait. Attacks by shoving its drill-hands into you. Randomly spawns from chests in Adobis's First Mission, a.k.a. Zakum PQ Stage 1. Wiz the Librarian has been possessed by Lotus's ghost! Involved in Phantom quests. A fast pig that jumps wildly. Resides in the Burnt Lands of Perion. A frightened Wild Boar that is the result of Francis's doll corrupting it. Found with regular Wild Boars. A red slime found in the bathhouse in Zipangu's Showa Town. 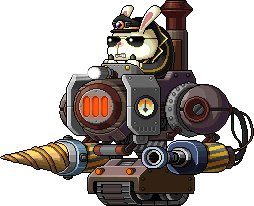 The boss of Riena Strait, a Black Wings bunny riding a giant drilling machine to destroy the glacier in Riena Strait. He can cast a buff which makes all your non-critical hits miss, as well as slowing you. He can charge the machine toward you, and blast you with flames from it. The main body of Easy Zakum. It is key to attack the body, as attacking the arms will not directly damage the body. However, it will make certain phases easier. While the arms are alive, the body will not directly attack, unless all the arms have been defeated before the last 20% of Zakum's health. In this case, Zakum will be able to charge up an attack, remaining stagnant for a few seconds, and unleash an explosion that does 99% of your health as damage. Zakum will also be able to summon 2 of each minion during this phase, as well as cast Weapon Cancel. 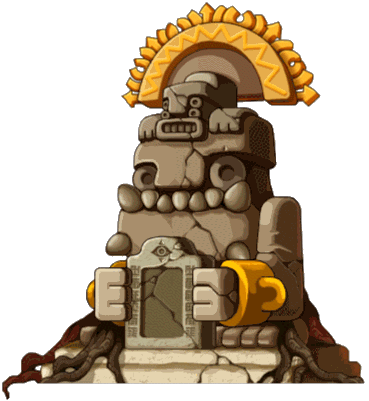 In the last phase of the battle, during the last 20% of Zakum's health, Zakum will gain new abilities. It will be able to burrow into the ground and reappear on top of you, as well as cast Magic Cancel, and cause rocks to fall from the ceiling, which can slow you down and prevent you from using special movement skills, such as Flash Jump. Its main attack during this phase involves a green cube appearing, and the players must hide under the cube to avoid taking 80% HP from its main attack, where it leaps into the air and slams into the ground. A pig surrounded by armor. It is speedy, but it does not deal much damage. However, it can raise its damage by 15%. Resides in the Burnt Lands of Perion. An boar surrounded by armor. Resides in the Burnt Lands of Perion. A boar covered in flames. Found at the end of the Burnt Lands of Perion. Involved in one of Xenon's quests. A mushroom with a chandelier on its head, found near Mushroom Castle. Attacks by jumping and pounding the ground. A troublesome creature holding a wooden board on its face. Found in Perion's Excavation Site. This page was last edited on 12 September 2017, at 23:39. This page has been accessed 475,395 times.